I simply love rigatoni. To this day I can still remember the cheesy sausage rigatoni my mom used to make when I was just a child. And seeing how I prepare it at least once a month, it’s safe to say that my husband and my boys love it too. But you know what I hate – when I need to shred a block of mozzarella and just after a few strokes, it starts to get chunky. You know these moments. I always end up wasting a ton of cheese in an effort to finish the dish before my boys become cranky. Freezing the cheese works, but who wants to wait for another 30 to 45 minutes for their meal? So is there a way to grate cheddar and mozzarella without ending up with large chunks of wasted cheese? Well, I’m glad to say that you can actually find a cheese grater for this sort of thing. Rotary cheese graters are designed for this because they have a drum blade within their housing. So all you need to do is put a piece of cheese in their housing, turn the hand and voila – you have a perfect topping. And as long as the cheese isn’t too soft (think of cream cheese) you’ll be able to grate it perfectly. Now, I know that households have a cheese grater, but I also know that they are usually very old and don’t actually work. I’ve even seen a couple of rusty ones, but my friends would kill me if I ever said anything more about it. If you’d asked me a couple of years ago about a rotary grater recommendation, in all honesty, I wouldn’t have a clue. I’d probably recommend buying an ordinary box grater at your local Target. But thankfully, I’m much, much wiser today. For starters, if you don’t want to end up with lumps of shattered goo on your sandwich or rigatoni, you naturally want to look for a grater with razor-sharp blades. And don’t worry, no matter how sharp the blades are, rotary graters provide the safest way to grate cheese without ever cutting your fingers (which often happens with standard grate﻿rs). And while you could always settle for a grater with only one drum, if you’re planning to prepare more than one type of food (and I’m sure you’re better than that), look for a grater that comes with a set of drums. Drums with small holes will handle hard cheeses and produce a fine grate while drums with larger holes will shred softer cheeses and provide great casserole toppings. Now, if you’re a person that mostly uses cheese for garnish, you won’t actually need a very large hopper. But if you’re anything like me, then you’ll want as large a hopper as possible. If you’re organizing or catering a party, you’ll surely need large amounts of evenly measured cheese for finger sandwiches (or any other type of appetizers for that matter). 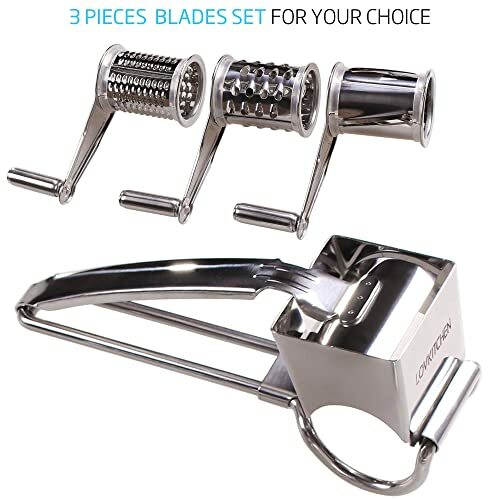 Next thing, I know that nobody wants to spend 15 minutes in the kitchen grinding cheese (it can distract you from cooking the pasta and ruin your meal for instance), so you should look for a grater that has a two-inch hopper. A large hopper will also prevent you from chopping down your cheese as much and stop you from blowing through pounds. Some large, metal rotary cheese graters are really bulky, so it’s understandable if you don’t want to waste time emptying out drawers and looking for the perfect place to store it. So if you opt for a little, plastic model, you have to check if the material will able to withstand the heat of your dishwasher. You see, if the grate is not dishwasher-safe, you won’t be able to sterilize it after each use. Of course, if the drum is too small (around one inch), it will be hard to wash it by hand adequately. Which brings us to our next point – you need to make sure that the drums are both dishwasher and rust-proof. Basically, this is the only way you’ll be completely sure that your grater is completely protected from any bacteria. While we’re on a subject of washing, I have to mention that if you want to scrub every inch of your grater properly, you need to pick up one that can be easily taken apart. This will allows you to eliminate all of those remnants that routinely get stuck in hard-to-reach cracks and turn moldy after a while. And who wants to get stuck disinfecting a kitchen utensil right before cooking? The handle, the drum, and crank should all be easy to remove, and personally, I don’t like tools (particularly electric grates) with a ton of pins and screws, because I always manage to lose them after a few weeks. But that’s just a personal preference, so don’t worry too much about the small parts. Also, some companies include brushes in their sets that allow you remove every single piece of cheese from the drum. In addition, I want to mention one more important thing – look for a grater that doesn’t actually require superhuman strength just to move it a few inches. No matter if you work out five times a week (or just a few times a month like me), a handle that demands all of your upper-body strength to move just isn’t worth it. Now let’s focus on what you really came here for – how can I help you find the best cheese grate ever. These five models are among the best-selling items on the market. Right here we have the original ZYLISS all cheese rotary grater – and while the regular version doesn’t have any major flaws, I would recommend the NSF-certified model, seeing how it has more design features (it allows you to switch from left to the right hand if you want) and is priced the same. The grater can be easily taken apart, and like most high-class models, it’s dishwasher-friendly. You can fit a 1.5-inch block of cheese into the hopper, and the drum is made from 100% stainless steel. And I have to say that this was certainly the easiest best hard cheese grater I’ve ever used. The rotating part of the handle is stiff and may cause some friction on your fingers. If you love cooking, then I’m sure you’re always looking for quality tools﻿﻿﻿ that can make your experience simpler for years to come. Fortunately, LOVEKITCHEN is a grade-A steel rotary cheese grater, which means it will last for a decade or few, no matter how much you use it. It’s also much safer for kids than most hand-held cheese graters I’ve used because you don’t have to hold the food while you’re grating it. You just need to place your cheese into the chamber and turn the handle that rotates the blades inside, and you’re all done. This particular rotating grater has been engineered and manufactured in Germany, and is made with the highest EU standards in mind. 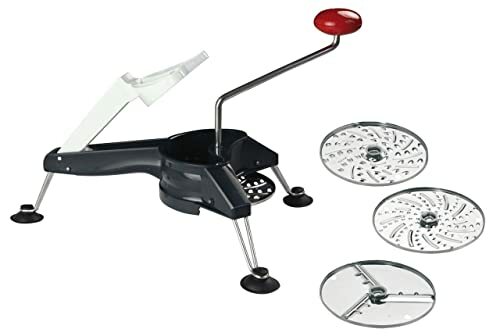 It comes with 3 different drums (for fine and medium grating and a slicer for veggies). Unfortunately, it seemingly lacks the sturdy feeling of some other handheld models on the market. Furthermore, when in use, the handle feels “bendy” in your palm, which gives you the sensation that it may snap any second. If your kids are big fans of cheese and hash brownies, and your family doesn’t eat too much pasta, all you need is an old-fashioned table cheese grater. 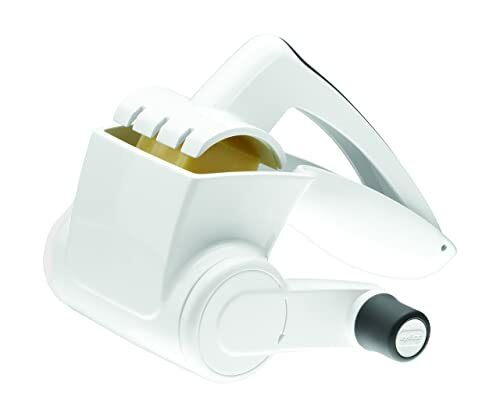 The KUUK comes with 2 additional, interchangeable drums (all of them are made of stainless steel) and you could easily use it to grate nuts, onions, and even garlic. The model has a suction cup, and while it’s a welcomed addition, it seems like it doesn’t work quite right (especially on though surfaces). Overall, it’s a simple kitchen utensil that comes in handy if you want to cut your grating time in half. With their latest cheese drum set, Orecchi Company went for a more polished and modern grater. 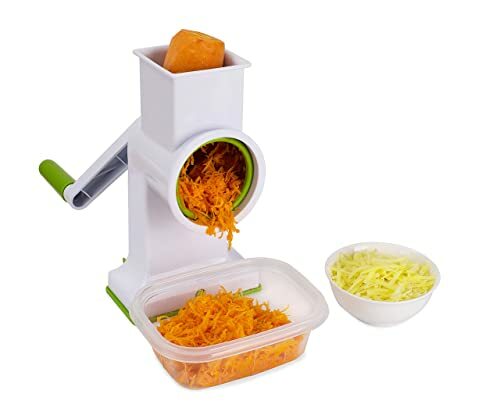 Furthermore, the company markets this grater as a child-friendly tool, which may be true, but in reality, you could also say that for every other grater on the list. It may have a thinner handle than other models here, but it’s still fairly reliable, but that doesn’t mean you should use too much power when pushing the cheese into the hopper. It may be a littler pricier than its competition, but the tool comes with a storage bag, and recipe book included. Even though great, professional cheese graters are a bit pricey (as you’re probably aware). So if you need something that’s both reliable and cost-effective, the ZYLISS Classic Rotary Cheese Grater - NSF Restaurant Certified should be the perfect choice for you. 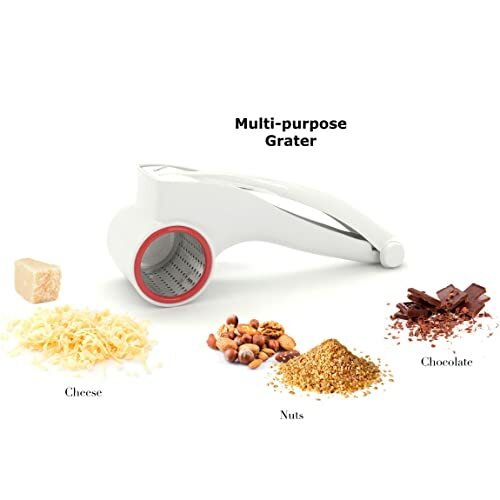 In addition to the price, this grater has a nifty design, is easy to use (works perfect for both lefties and righties) and even easier to clean. If you or anyone knows a good GRATER I’m all ears but even the best rated “graters” on the market that I can find are shredders. Kris, I know how you feel. And I must tell you; you’re looking at the problem from the wrong perspective. Rotary cheese grater can’t produce that level of the grate that you’re looking for. These rotary graters are indeed called graters even though they basically shred the cheese. It all depends on what do you need. If you’re after a rotary cheese grater, these are most certainly the best.